Mold is a living organism found virtually everywhere you look. Tiny mold spores float through the air, landing on surfaces and waiting for the perfect conditions to set up a colony. Perfect conditions for mold spores are simple: water and food sources. Without water and food, mold doesn’t have a chance. With it, mold can thrive. It doesn’t take much moisture to satisfy the water source condition. As for food sources, mold isn’t picky. In fact, it considers just about anything it lands on a food source including drywall, paint, upholstery, carpet fibers, wallpaper, and ceiling tiles! To top it off, once conditions are right, mold quickly sets up a colony and once present is extremely difficult to eradicate. As you can imagine, a plumbing, storm, or flood event puts your home at risk for mold. Whether mold appears after a known event or you have just discovered mold in your home, we are a full service contractor experienced in removing mold and making necessary repairs afterward. As part of the water damage restoration, we take the threat of potential mold growth seriously and offer mold inhibitor treatments designed to minimize mold growth. 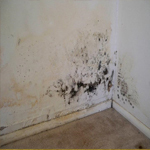 Mold inhibitors adhere to surfaces, forming a “new” service which resists mold spores. Applying mold inhibitors after water has accumulated can prevent the nearly inevitable emergence of mold and mildew following water damage.